Exchange Online Backup software is designed in such a manner that it can backup Exchange Online mailboxes to PST or EML format on local drive. All the components of Office 365 including emails, mail attachments, contacts, calendars, and documents are exported into equivalent PST or EML file without altering any information. The plus point is that tool can be downloaded on all Windows Operating system, ranging from Windows 10, 8.1, 8, 7 to earlier editions. The Exchange Online Database Backup tool is devised to export single or multiple O365 mailboxes on local server or system in the minimum span of time. Besides this, to make Exchange mailbox backup more customized, the tool has a filter named as Categories. With this feature, you can either select Mails and Document both or any individual data item folder. As per requirement, users can check the box labeled as Mails and Document. One Time: This option is used to create a backup copy of the entire emails and document on a specified date and time. Daily: It is used to download data items on a regular basis on designated location. Weekly: If user wants to make a backup of Exchange mailbox data on weekly basis, then this option is best suited. Monthly: This option lets users download mails & documents on the basis of month. After the backup of Exchange Online Mailboxes to PST gets completed, the tool creates a complete summary report of entire process. The aim of this file is to give information of backup task such as Mail Count, Fail Count, Time, Destination, and Status. Further, users are free to save this report on local machine in CSV file extension for future reference. 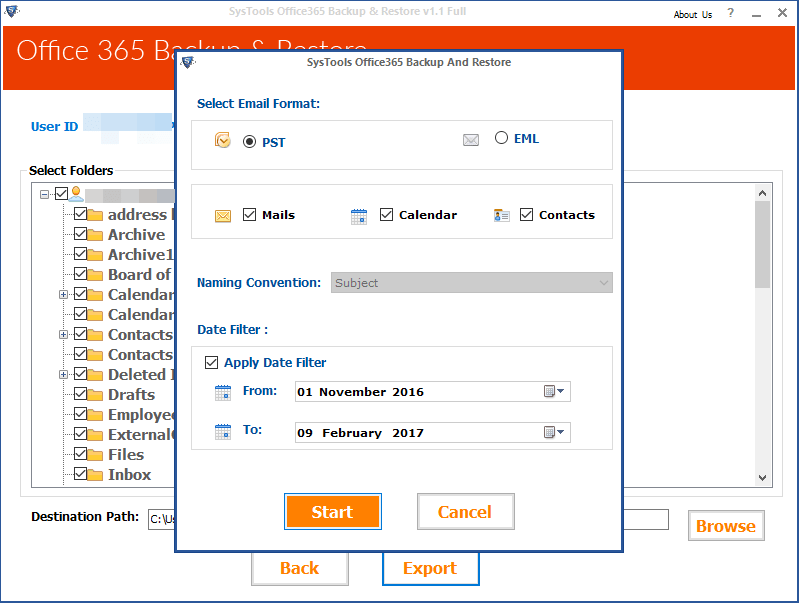 Backup Exchange Online Mailbox to PST Software is the safest and cost-effective way to backup O365 emails, contacts, calendars, and documents in Outlook supported file format or EML type. Luckily, the same tool is able to restore data from multiple PST files to Exchange Online account without any hassle. As a result, the user gets two functionalities in a single tool i.e., Backup & Restore. Plus, the utility efficiently meets legal compliance standards. To make backup task more facile, the application provides another advanced feature named as Date-Based filter when you export Exchange Online mailboxes data to PST or EML. Using this functionality, one can filter out data on the basis of specified date range. This option undoubtedly downloads mailbox items within a particular time span without any error. The another interesting feature offered by Exchange Online backup software is Split PST File. Basically, this option added in the tool to manage large-sized PST file into small file of definite size. Ultimately, it protects the Outlook data file from data corruption occurred due to large size of .pst. So, check this option while taking backup of the large volume of mailboxes into PST. The tool always preserves the original folder structure and meta-data properties of mail throughout the entire process. To use this feature, you need to select the box corresponding to Maintain Folder Hierarchy. By doing this, when you import the resultant backup file in on-premises Outlook the same hierarchy of folder will be viewed that was present in Exchange Online. 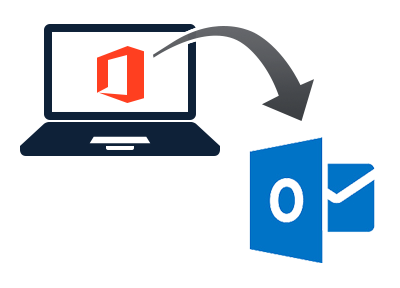 With the help of Restore option, the software to backup Exchange Online Office 365 can import multiple PST files data into Exchange account in least time utilization. For this, one can need to login with Office 365 account using software. After validating the profile, select Restore option and upload PST files and import them into Office 365 account. With free Exchange Online Backup Software you can export first 100 emails and first 25 other items from Exchange Online mail to PST and EML (only email messages) format. How can I backup my Exchange Online mailbox to PST format with this tool? 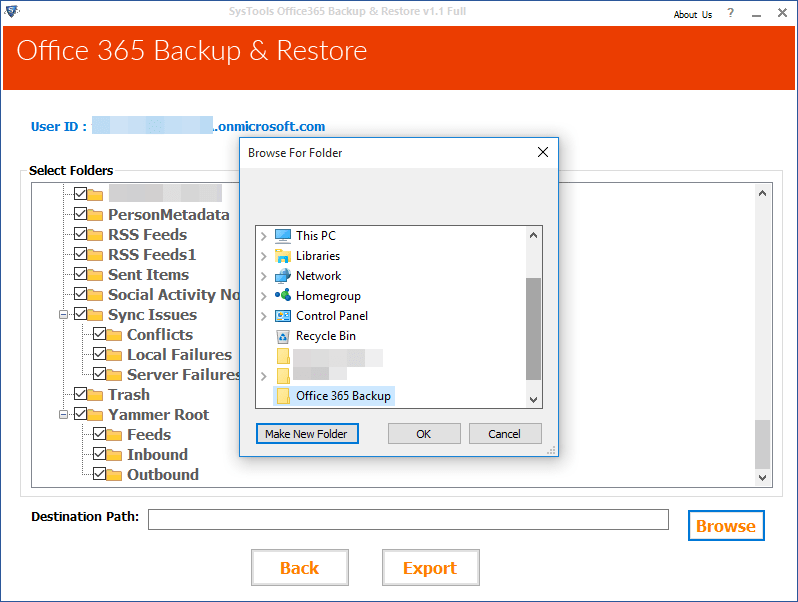 Steps to backup O365 data items with this tool. Download and install Exchange Online Mail backup software. 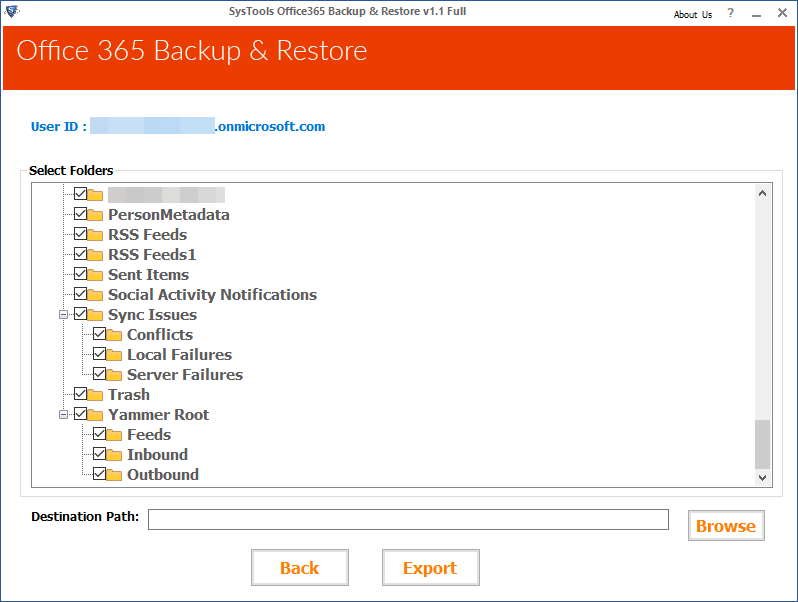 Use filters to backup chosen O365 items. You can also schedule backup. Just apply Start Date and Time. Click on “Finish” to Begin. How many numbers of mailbox(es) can tool export on the local machine? In Exchange Online Backup Tool, there is no limitation on mailbox(es) for backup process. Thus, you can download as many Exchange mailboxes data in PST or EML format on local system in one go. How do I get back the downloaded data into Exchange Online mailbox? Using Restore feature of tool, you can easily restore the data from PST file to Office 365 user account without any hassle. Is it possible to backup Exchange Online emails within a certain date range? Yes, the tool lets you to use Date range filter for mailbox items during backup task. With this feature, one can download data within a particular timeline on designated location in desired file type. 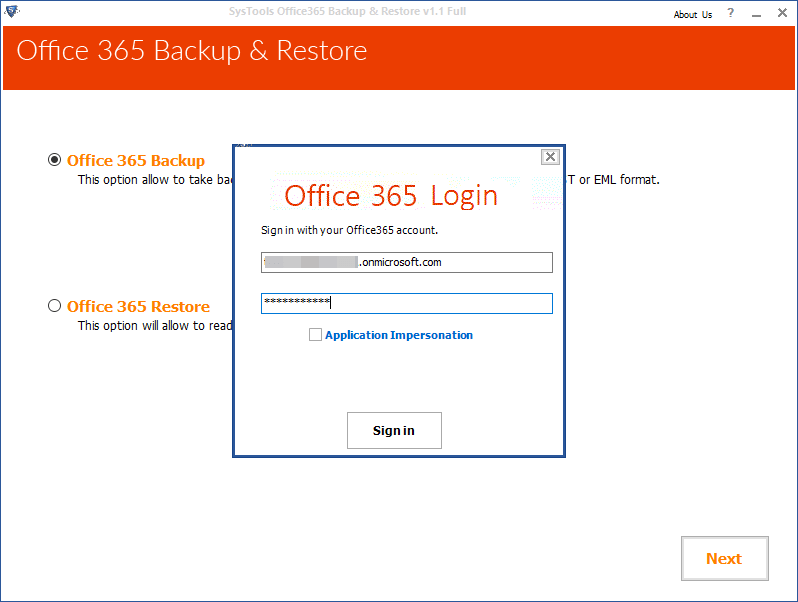 Does software backup mailbox(es) of Office 365 Enterprise E3? The Backup Exchange Online Data is a utility that supports majorly all O365 subscription plans such as, Office 365 Enterprise E1/ E3/ E5, Exchange Online Plan 1, Exchange Online Plan 2, O365 Business Premium, Office 365 Business Essentials, Office 365 A1/ A3/ A5.